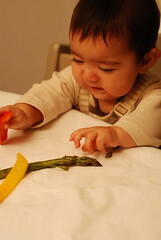 So let me get this straight, Mommy and Daddy... you're going to try Baby Led Weaning with me? 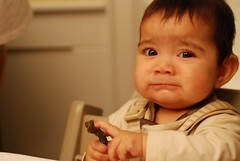 That means you introduce me to solid foods and I get to feed myself, no spoon-feeding and no purees? And I get to sit at the table with you and have my own share of the food? I'm game! What's this green thing? 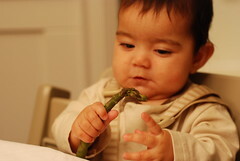 Asparagus, you say? Okay, I'll try it. It looks fun enough. YUCK!!!! WHAT ARE YOU DOING TO ME? That tastes horrible!! What else you got? Something red? I like red! Okay, let's try the red pepper. Man, THAT TASTES JUST AS BAD AS THE ASPARAGUS!!! 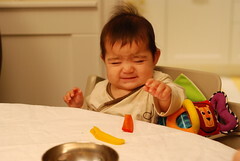 I'm not even trying the yellow pepper! More, more, more! I want to eat something else! Banana? Ooh, now that's fun to hold. Okay, its not so bad. I can get some of it in my mouth. What are those asparagus and pepper thingys doing there? Didn't I tell you yesterday I'm not interested?! Yay, more banana! Sometimes it tastes good. Maybe I'll just stick to eating my bowl. To learn more about Baby Led Weaning, read the book by Gill Rapley and Tracy Murkett or visit these links. I am not gonna lie , this makes me so concerned , I have fed between 10-12 babies if memory serves me correctly from this stage daily for years gradually working to this point, I have never heard of such a thing , I have performed the hymlic on numerous kids over the age of 1 who were self feeding . Some kids love all foods some kids like few. Serious question how will she get proper nutrients and quantities, cereals and grains ? totally curious. I am very liberal but this seems very risky , if you have experienced kids choking and I have throughout my more than 10 years of full time daycare from young to old, it shakes you to the core . 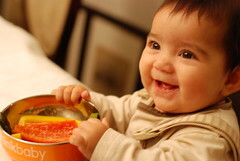 I made baby food fresh and never used jarred because I was concerned about baby food quality . Keep safe , I am sure you have learned and know what you are doing according to the resources , but it seems scary to me. Thanks for the comment Chris (and I know there was no criticism intended. You are always so kind and thoughtful in your comments). I knew this may be a controversial post so I was prepared for that. In terms of nutrients, Chloe is still breastfed. At this early stage, 'eating' food is not for nutritional purposes. 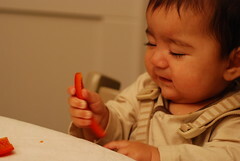 It is more for exploration of textures, learning to hold and grasp, and tasting. When Chloe is hungry, I breastfeed her. She gets food only at times she is not hungry, if that makes sense. As for choking, I hear you, that was a great concern of mine too. But as I found in researching BLW, there is a difference between choking and gagging. 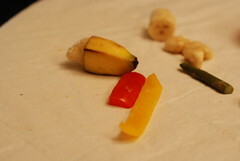 The premise is that a baby who is in control of their food will have a better idea about portion size. This is not to say a baby won't gag (all babies gag, even spoonfed ones) but as long as a baby is upright and can cough up any lodged food, the risk of choking is equal or less than that of a spoonfed baby choking. There was also the idea that spoonfed babies have no sense of size or amount because the spoon is thrust at them to the back of your throat. 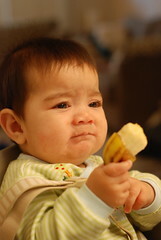 If you think, with an adult, if someone puts a spoon to you you look at it, assess the portion, and instinctively take the portion in little bites at the front of your mouth. 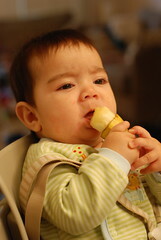 This is not what is done with babies; they are given a spoonful and primarily it goes to the back of the mouth with little opportunity to taste or (and not at the back of the throat). Control of 'bite size' (and I use that loosely because Chloe is really just licking her foods; she hasn't actually taken bites), gaining experience with textures and tastes, letting the baby choose if she wants to continue or stop eating (so in turn she doesn't develop any 'pickiness' or fear of foods) are some of the supposed benefits of BLW which I agreed with. I totally understand its not for everyone, but thought it was right for us. BLW is not a new idea, but only recently has been put into 'print'. 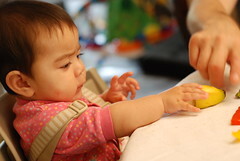 Many families especially those with multiple children have actually let their children eat what they eat so to speak instead of preparing baby-specific foods. Those are absolutely beautiful photos!!! She is so very, very cute. Very interesting topic, we are just introducing solids to our lovely 6mth old daughter. I have not heard of BLW, but it does make sense. Enjoy!!! That's it. I'm calling Jeremy and meeting him at lunch to make a baby. It's all your fault. 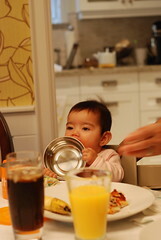 our daughter never let us feed her and so she learned to feed herself and never choked. Our pediatrician said that was normal for some kids- they are just really independent and skip the feeding stage. I didn't know it had a name. I always figured if she wasn't getting enough nutrients it was because too much junk food was available. Good luck- I love the pictures! I'd say that she's probably go for the sweet and soft fruits more readily that the other 'yucky' stuff you're giving her!! Best of luck!! Its really fun fun fun from now till she's two!! LOVE the photos! her facial expressions are priceless. As far as BLW goes, well, i say you've gotta do what's right for you and your child. JTCF - Thanks. I may take you up on your offer :) I'm looking forward to the fun stage. For now, I'm still in that afraid of choking, hovering and ready to jam my finger in her mouth and rend out any wayward piece of food stage, lol. Roshni - from now until two?! I'm barely staying one step ahead of her as it is, heeehee. These pictures are great. Her facial expressions are priceless. What a doll. She will love looking at these pics someday. Great response to your first commenter, btw. I'd never heard of BLW until I read about it on WB. I think I will try it as well when the time comes. The photos and the captions are awesome! My son is mostly a self feeder as well by nature. He just wanted to do it himself and we have yet to have a problem and he is 14 months. Best of luck! I just found your blog and am delighted you're a fan of BLW. I LOVE the photos of Chloe! 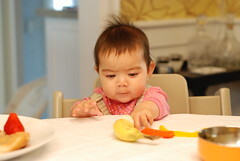 I'd really like to have a chat - could you email me at gill@rapleyweaning.com? 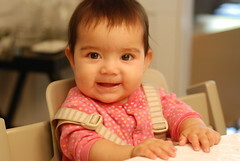 Awesome pics of your sweet little Chloe... and love the Stokke! We have one too! As for BLW, we did this instinctively with our kids, mostly because they have categorically refused to be spoon-fed. I have noticed that they often had an easier time with larger/whole pieces of food than with little chopped up bits... maybe because like you suggested they can control the amount that is going into their mouth? I think key here too is that babies should be supervised while eating regardless. This is such a lovely blog :) Chloe is the most expressive baby I'd ever known! Love every single expression on her pretty 'lil face. Interesting blog you got here. It would be great to read something more concerning this theme. I just laughed "out loud" at this post. So funny how you told it from her point of view! I just happened across your blog - the house looks fantastic! Congratulations! I'm actually really interested in BLW. I hadn't heard of it until I read it here and now I'm very intrigued. I've ordered the book you recommend. A question for you (and possibly the book answers this once I have it) - We have a 4 month old daughter so we were just getting ready to attempt rice cereal. 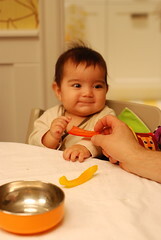 Did you completely skip this step and just launch into solid foods at 6 months? I was really excited to start food, but I really want to try this, so it sounds like we wait another couple months? Jenn - thanks for visiting! BLW is recommended for babies over 6 months as by that time their digestive systems are developed anough and they have the ability to grasp food. 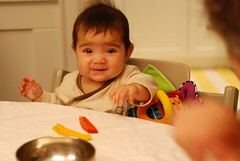 We offered both solid foods (e.g. bananas, avocado toast) and spoonfed non-finger foods (like yogurt and rice cereal) on occasion. We tried to let her self-feed as much as possible though. Good luck with BLW!